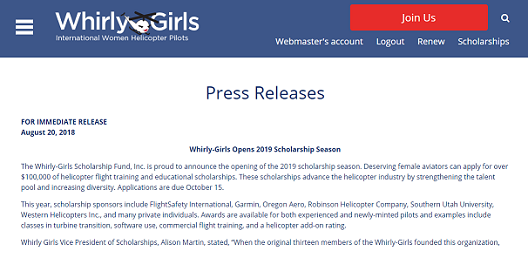 Whirly-Girls scholarship season is open, and there are a lot of exciting scholarships available, including new instrument/commercial training scholarships from Southern Utah University (SUU). Do you have questions about the Whirly-Girls scholarship program or how to apply? Contact Vice President of Scholarships Alison Martin at scholarships@whirlygirls.org.